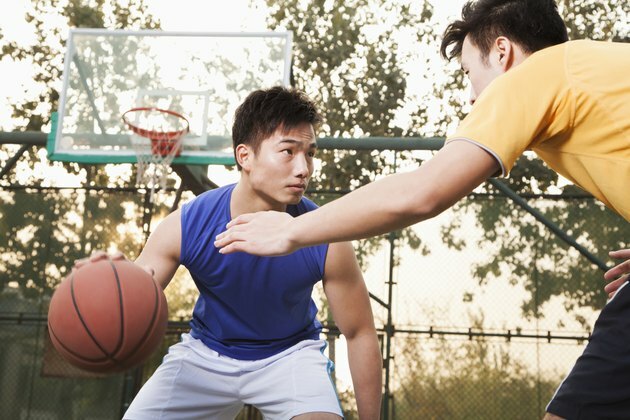 Basketball can be a great aerobic exercise that also tones your muscles. The calories you burn playing basketball for 30 minutes varies from person to person and type of basketball activity. According to the Centers for Disease Control and Prevention, moderate-intensity activity is when you can still carry on a conversation, but you can't sustain singing. Vigorous-intensity activity enables you to only say a few words at a time without stopping for a breath. You burn more calories in vigorous activity, such as a full-court, five-on-five game of basketball than moderate activity, such as half-court solo practice. The American Council on Exercise defines three types of basketball for calorie-burning calculations: game, non-game/general and shooting hoops, in descending order of intensity. A 150-pound person will burn about 204 calories in 30 minutes playing basketball but not in a formal game, versus 153 calories shooting hoops and 272 playing a game. The more you weigh, the more calories you'll burn doing the same exercise. For example, as previously mentioned, a 150-pound individual burns about 272 calories playing a 30-minute game of basketball. Doing the same exercise, someone weighing 100 pounds burns 181 calories and someone weighing 200 pounds burns 363 calories. This works out roughly to 91 calories burned per 50 pounds of weight per 30 minutes. How Many Calories Does Housecleaning Burn?